‘Football’ is a restless beast and football’s blogs, tweets and print media are twitching with unease; not just amongst Town fans, but amongst all fans. That unease centres on some simple questions. Exactly why do we love football, follow a club and spend vast amounts of money and time in the process? Does coming to Portman Road every other Saturday really mean anything, anymore, in a 21st century consumed by consumerism? In my heart the fan’s romance beats strong. Yet there is a decent argument to be made that wage levels are obscene, ticket prices are crazy, players are cynical, the sport is over-exposed and a lust for money has degraded what used to be spontaneous and comparatively egalitarian entertainment into a televised and repetitive ‘product’. OK yeah … but despite such blatant shortcomings, football retains a mysterious hold over my middle-aged mind. And I have finally worked out, after the recent dull seasons of Town toiling at home, that my fidelity is inexplicable when linked simply to events on the pitch. If we relied only on what ‘professionals’ serve up as ‘entertainment’ would most of us bother to watch – let alone PAY? I doubt it. The worse the actual football has grown, particularly at Portman Road during the last few years, the clearer it becomes that football as a fan is so much more than 90 minutes of sport: football is really about ritual, community and friendship. That is why this blog bears tribute to a woman who never played football and very rarely went; but whom for me, over the years, grew to signify so much about what football really ‘means’, at the bottom of my blue and white heart. Joyce Wade died on 14 November, 2012. For the last 53 years she had been a (more or less) unbroken presence to her many and varied neighbours in Elliott Street, Ipswich. That was because, like scores of others fifty years ago, Joyce lived above and ran a local corner shop. She and her prospective husband Roy opened their few square yards of floorboards, shelves, tins and jars in July 1959. Sandwiched between London Road and Portman Road, the lattice of Victorian terraces from which Joyce drew customers was in the early 1960s a hive of active pubs, clubs, shops, garages, small factories and businesses. This was an age when the supermarket, out of town shopping and credit cards were still distant or unimagined. This was ‘The Town’ not of football fame but the town of the community behind the club, the town of Ipswich which pre-dated ‘the club’ and the kind of neighbourhood typical of the thousands of urban and rural communities across the UK, from which football had grown in the first place. Whilst Joyce and her husband Roy were founding their shop in Elliott Street, a few hundred yards away at Portman Road Alf Ramsey was building a legend. Joyce and Roy were married on 15 July 1961. Six months earlier football’s ‘maximum wage’ had been abolished, leading to the amazing phenomenon of the ‘£100 per week footballer’. Market logic would suggest this favoured rich clubs with large crowds and big money. 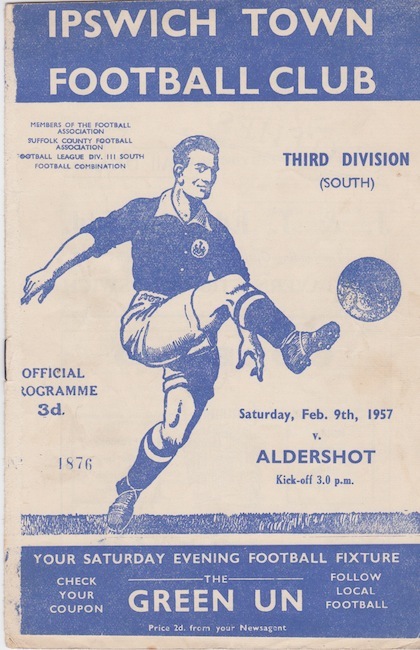 Yet in April 1961 Ipswich were promoted as Champions, from the Second to the First Division. Sheffield United were runners up, a little club called Liverpool were third and a tiny club named Norwich were fourth. Twelve months later, in April 1962, Ipswich Town achieved the unimaginable. We, the lads from Suffolk, the minnows, the newcomers, the country cousins, won the First Division (today’s Premiership) at our first attempt: tipping the glamorous Spurs and another outstanding provincial club (Burnley) to a hard-fought title. And this is where we go back to that corner shop in Elliott Street. Joyce spent most of those 53 years, from 1959 to 2012, watching the people walking past her shop and talking to those who came in. One of those people was me, cutting down Elliott Street on match-day Saturdays with my own father in the 1970s and 1980s; and visiting Joyce’s shop each match-day with my own son in the 1990s and 2000s. We would buy a lucky chocolate bar or a bottle of drink of course, but most of all we would chat. Joyce loved to chat and the stories flowed: about her son Julian, about her home town of Dundee, about the war, about opera singing, about being born with her twin sister on Christmas Eve, about the sadness of her older sister’s deaths, about being the daughter of a Methodist lay preacher, about her school days and friends, about her memories of loves and hates and pretty much everything else in between. And of course there were football-related stories in which she delighted: like the one about a cheeky kid from round the corner running errands for his mum. Knock-kneed and bandy legged, as Joyce remembered him aged nine “Kieron couldn’t even walk straight let alone run straight – I don’t know how he EVER managed to play football.” For younger readers the ‘Kieron’ of Joyce’s story was of course Kieron Dyer, who by the age of 17 was one of the most talented youngsters our famous Academy had ever produced, and who brought the club £6 million when he was sold to Newcastle in July 1999. Then there was the story of Jason, another young lad who frequented Wades’ Stores. Jason Dozzell grew up in Elliott Street, played over 300 times for Ipswich and was sold for £1.9 million to Tottenham Hotspur in August 1993. His mother stayed in the street and remained a valued customer and friend until Joyce’s recent death. Over the years Joyce and I became firm, match day friends: and over the last few years it has been genuine friendships like that, costing no more than time and care, which have been a stronger reason to spend match-days in Ipswich than much of the expensive nonsense on and off the Portman Road pitch. For despite the fact that Joyce claimed not to know much about football it felt to me that she knew masses about Ipswich, about living in the changing Town we love, and about serving her community. Rest in Peace, Joyce Wade. Thank you for the friendship, the chocolate bars and the chat; and most all for helping me to remember that football is about so much more than a slightly daft game, with way too much money.